Things have changed, times have changed, and times are tough. Since the recession began, most of the new jobs added in our “recovery” each month are low paying service and retail related positions, not the higher paying jobs we saw before the recession. Bottom line: the competition for higher paying jobs is extremely fierce. This means you have to change your mind set. You have to take control. Start by reordering your priorities. Stop spending all your time chasing posted jobs on Internet job boards. 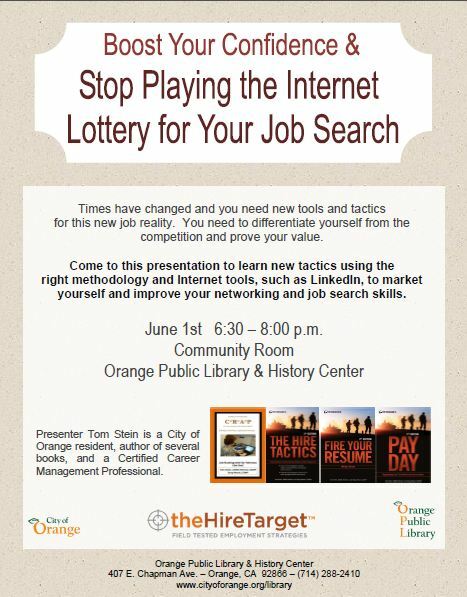 If you’re relying on playing the Internet Lottery to find your next job you’ve got a “Monster” of a problem. Limit your “Career Builder” playing time to 15-20%. “Indeed,” you may get lucky by rolling the “Dice,” paying to climb “Ladders,” all the while looking for those “Hot Jobs.” Who knows, eventually you may end up “Simply Hired.” But there’s a better way to land the job you really want. STOP WORRYING ABOUT FINDING A “JOB” AND START THINKING ABOUT YOUR EMPLOYABILITY! Your resume is a necessary evil. You have to have one because that’s how the game is played. But it’s doing a lousy job of getting you in front of the hiring manager – the one person who can truly appreciate the value you bring to the table. This is the BIG shift you need to make in your thinking! Instead of chasing posted jobs, start thinking about the kinds of companies you’d like to go to work for. What is it that makes you employable to your targeted companies, moving forward? It’s a lot more than static information on your resume. Your resume is old news! Companies don’t hire you for your past; they hire you for their future, Your value is a blend of your skills, experience, expertise and style that may uniquely fit your targeted organization and be instrumental in helping them increase profitability. Sending your resume into targeted companies where you’d like to go to work and where you know you would bring added value is not enough; you need to identify the hiring manager. How do you find the names of hiring managers in your targeted companies? This is where your professional network comes in, particularly the people you’re connected with if you’re on the business-oriented social media site LinkedIn. Without a doubt, the best way to get an interview is to be referred to the hiring manager by someone he or she trusts. Again, this is where LinkedIn can help. Educate the business community (hiring managers) about who you are, and the potential value you offer, WITHOUT using your resume as an initial means of introduction. This is where your Biography comes into play. For more information on these tactics and samples of a biography and associated cover letters, please don’t hesitate to email me. Are you willing to finally take control of your job search? Many of us in the military environment need a bit of bitter truth so I offer the below message to you all! Here’s some advice to those of you who remain stubborn, still engaged in mass resume distribution and waiting for the phone to ring: TAKE CONTROL OF YOUR JOB SEARCH! Stop waiting for opportunity and start creating opportunity. Be willing to change your mindset. You need to conduct a strategic vs. traditional job search that focuses on broadcasting your VALUE to the business community, not your resume. Your biggest challenge in job search is differentiation. Right now, how do YOU stand out from the millions in a highly competitive job market? Think your resume makes you stand out from the crowd? Think again. You’ve probably tweaked your resume to death since you began your job search, and now you think you resume is one in a million. Well guess what….it is. It’s one of millions. Regardless of how much you paid someone to prepare your resume, no matter how professional your resume may look, how stunning your experience and accomplishments may be, or how impressive your education is, at the end of the day your resume is a resume, is a resume, etc. Therefore you look like everyone else. Get the picture? Like everyone else’s resume, yours will inevitably end up in Human Resources – sitting in a stack a foot high or entered into some massive database. And there sits some overworked personnel jockey who, if you’ve been lucky enough to get past the screening software, will glance over your “powerful resume” for no more than 15 to 30 seconds. Do you really want that personnel jockey deciding if you’re valuable enough to put in front of the hiring manager for an interview, or do you want the hiring manager making that decision? Don’t misunderstand me; you need to have a professional resume. It’s what I call a “necessary evil.” Your resume is a critical component of your job search. But use it as backup, as reinforcement, and provide it only when specifically requested by a hiring manager. If you must submit your resume when responding to a posted position, understand that it will end up in Human Resources. HR is what I call “Hiring Resistance” because the whole process starts with rejection. How good are you at handling rejection time after time while you wait for something to happen. Remember Einstein’s definition of insanity: doing the same thing over and over again and expecting different results. You need to stop being REACTIVE in your job search and start being PROACTIVE. That starts with taking control. The employment figures are out for the month of March and while certain sectors of the economy are showing signs of recovery the number of new jobs added for the month (192,000) are simply not enough. The unemployment rate remains stubbornly high at 6.7% with 10.5 million people out of work, and the employment participation rate is around 63%, the lowest level since Jimmy Carter was president in 1978. To make matters worse most of the new jobs added are low paying service related positions, not the high paying jobs we saw before the recession. Bottom line: the competition for higher paying jobs is extremely fierce. And remember, since we Military families represent about 7% or less of the population we face much greater challenges and obstacles when entering, or competing within, today’s job market. This means you have to change your mind set. Start by reordering your priorities. Stop spending all your time chasing posted jobs on Internet job boards. If you’re relying on playing the Internet Lottery to find your next job you’ve got a “Monster” of a problem. Limit your “CareerBuilder” playing time to 15-20%. “Indeed,” you may get lucky by rolling the “Dice,” paying to climb “Ladders,” all the while looking to “GetHired.” Who knows, eventually you may end up “SimplyHired.” But there’s a better way to land the job you really want. Your resume is a necessary evil. You have to have one because that’s how the game is played. But it’s doing a lousy job of getting you in front of the hiring manager – the one person who can truly appreciate the value you bring to the table. Use your professional resume as backup, as reinforcement. Don’t rely on the ATS (Applicant “Trashing” System) that’s used by most HR departments to get you in the door and in front of the hiring manager. That’s what I call the C-R-A-P approach to job search and it isn’t working. Sending your resume into targeted companies where you’d like to go to work and where you know you would bring added value is not enough; you need to identify the hiring manager. How do you find the names of hiring managers in your targeted companies? This is where your professional network comes in, particularly the people you’re connected with if you’re on the business-oriented social media site LinkedIn. Remember Point of Aim is Point of Impact! For more information on these tactics and samples of a biography and associated cover letters, please don’t hesitate to email us at tom@thehiretarget.com or greg@thehirechallenge.com. Are you willing to change your mind set?